Opens with a gentle press; smartbucket bag change system; removable plastic liner; with a brushed finish. Tuck away excess bag into the bag tuck opening to keep the bin looking neat and tidy. 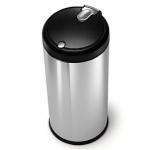 This classic round bin has a soft touch lid which opens and closes with just a gentle press. The dent-proof plastic lid won't show dirt or fingerprints and the space-efficient profile hinge lets you place this bin closer to the wall than traditional hinge designs. Also has a non-skid base. Includes 5 year warranty. Free delivery to local store if ordered online. misleading price, i saw instore £37 reduced to £29. Not really it may have been reduced and reduced again. SH bins are usually sold for around £70 ish plus. It's a good price. Keeps smells out, keeps bin bag hidden, better materials (easier to clean to give flawless look without wipe marks), better build quality (plastic won't shatter if bucket is dropped). My cheap old aluminum bin suffered from all of these issues. Still, wouldn't pay full price for one of these, but £30 is a fair price for me. Keeps smells out, keeps bin bag hidden, better materials (easier to clean … Keeps smells out, keeps bin bag hidden, better materials (easier to clean to give flawless look without wipe marks), better build quality (plastic won't shatter if bucket is dropped). My cheap old aluminum bin suffered from all of these issues. Still, wouldn't pay full price for one of these, but £30 is a fair price for me. Totally after spendin say £15-£20 on argos or other shops cheap generic bins, only to have the catch go or something, I "invested" in a decent bin and it was well worth it, plus these and the parts are guaranteed for years, no breaking peddles or lids etc. Well worth it, if you use a bin a lot, for say a large family. You realise you sound desperate and that is probably a bloke right? so, how much are the bags for these? We have a simple human bin - really good, but I don't understand soft touch bins - why would you want to touch the top of a bin to open and close it? not very hygienic, pedal bins are much better. The simple human pedal bin we have is surprisingly good at keeping smells at bay, how it is less smelly than the old Argos bin is a mystery to me, it's not just that the lid is closed tighter, it's that the stuff inside the bin smells less, how or why I don't know but it's definitely a good thing. We use normal Tesco liners, so long as you get the right size (litres) and style then I don't see why you couldn't use Tesco bin liners in this. Good price for a Simple Human bin. Personally, I prefer the butterfly opening pedal ones (which I have), as I don't have to touch the lid. Had one for 3.5 years and it is still going strong (excellent condition) after daily use. I bought one of these when Argos were selling them at half price (and that was £30 then). Since purchasing the original, I have since had 2. Not really worth the money in my opinion and the only consolation has been the 5 year guarantee. Thanks OP. About 7 left in-store at Park Royal if anyone's interested.